Sports and sports injuries can create some major drama! If you like watching it all unfold, you need to check out these sports drama movies like Concussion. Concussion is a story about a doctor who finds something shocking that is happening to football players. Drama None of these movies are on Netflix this time, but one of the movies does have a spinoff tv show that is streaming, and I’ve mentioned it below! You’ll also find more info about the movie Concussion, the trailer, and all the details for these fab movies to watch like Concussion. Check out my list below! Concussion is a 2015 biographical sports drama movie that was released in theaters on December 25, 2015. 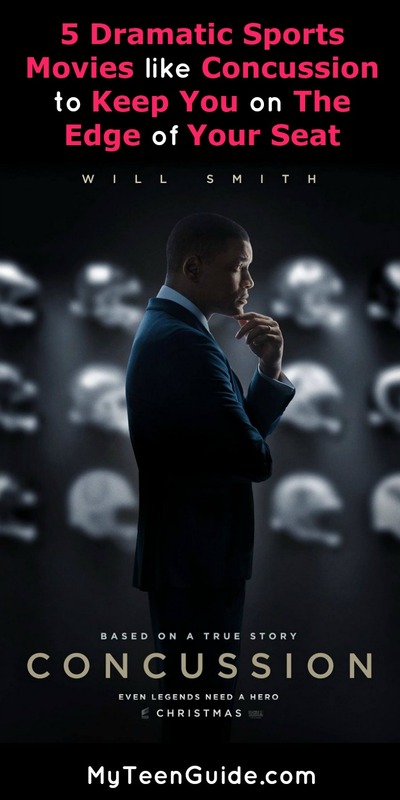 The movie is the story of Dr. Bennet Omalu, a renowned pathologist, who discovers the truth about the connection of professional football players and CTE, chronic traumatic encephalopathy. The movie stars Will Smith, Albert Brooks, Alec Baldwin and Gugu Mbatha-Raw. Here are some movies that are like Concussion. Friday Night Lights is a 2004 sports drama movie, which highlights a high school football team in Odessa, Texas and the city that is obsessed with them. The movie is based on the 1990 book Friday Night Lights: A Town, A Team and a Dream by H.G. Bissinger. The movie stars Billy Bob Thornton, Derek Luke, Lucas Black, Garrett Hedlund, Tim McGraw, Lee Thompson Young and Jay Hernandez. While the original movie is not on Netflix, there is a new 2010 tv show based on the same story (with the same name!) that is on Netflix. Awakenings is a 1990 drama movie that is based on 1973 memoir Awakenings by Oliver Sacks. The movie is based on the real-life story of Oliver Sacks, a neurologist who is credited with discovering the benefits of the drug L-Dopa in 1969. The movie stars Robin Williams, Robert De Niro, Julie Kavner, John Heard, Ruth Nelson, Max Von Sydow and Penelope Ann Miller. This movie doesn’t follow a specific sports trauma, but it has widely been criticized as some bodybuilders will commonly use this drug as an enhancement drug. This discovery also led to a treatment option for Parkinson’s disease. Invincible is a 2006 sports drama movie that is based on the real-life of Vince Papale, an NFL player who played for two years (1976-1978) for the Philadelphia Eagles. The movie stars Mark Wahlberg, Elizabeth Banks, and Greg Kinnear. The Blind Side is a 2009 semi-biographical sports drama movie that is based on the 2006 book The Blind Side: Evolution of a Game by Michael Lewis. The movie is based on the story of Michael Oher, an NFL offensive lineman for the Baltimore Ravens, the Tennessee Titans and currently with the Carolina Panthers. The movie stars Quinton Aaron, Sandra Bullock, Tim McGraw, Jae Head, Lily Collins, Kathy Bates and Ray McKinnon. This is one of my fav movies like Concussion, this movie is seriously good! The Express is a 2008 sports movie that is based on the 1983 book Ernie Davis, the Elmira Express: The Story of a Heisman Trophy Winner by Robert C. Gallagher. The movie showcases the life of Ernie Davis, the first African-American to win the Heisman Trophy, playing football for Syracuse University. The movie stars Rob Brown, Charles S. Dutton, and Dennis Quaid. So lovelies, do you know any other dramatic movies like Concussion that we all should be watching? Tell me what you think down in the comments!